To discuss this movie intelligently and thoroughly without giving away spoilers or ruining the surprise tone is practically infeasible. As such, if you would like to have a completely unfettered and uninfluenced viewing, please move along…we warned you! Darren Aronofsky, the director of films such as Black Swan and Requiem for a Dream, can take even the most mundane of activities, and create a sinister, off-putting atmosphere. He does so amazingly here in his newest film, Mother! However, anyone coming for another horror movie, or as a remake of Rosemary’s Baby or other such fanfare, is really in for a surprise. 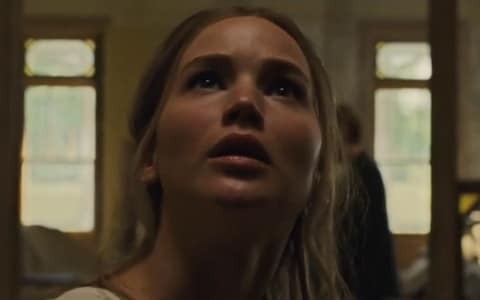 The first act of the movie spends a lot of time with Jennifer Lawrence’s nameless character cleaning, renovating, and working on the house while her husband, Javier Bardem’s also nameless character, is struggling to overcome his writer’s block and create the next big novel. As she is cleaning, there are moments when the house itself seems to have a spirit, or even a life of its own. Lawrence hears creeks when she is alone, and suffers from some unknown illness which seems to have all of her senses into overload. Soon, Ed Harris and his wife, Michelle Pfeiffer, both of whom are big fans of Javier’s earlier work, and who also don’t have onscreen names, show up to the house. After that… things start to take a turn for the surreal. The ghost or other super natural entity that might possess the house or otherwise terrorize or influence our happily married couple is little more than a red herring. There are no things that go bump in the night, and there are no monsters that have ill will and can’t be stopped. This movie is about people; and often, some of the things that they do are far more horrific than the monsters of other films. Lawrence spends a majority of the film, chasing strangers and friends of those strangers around her house, trying to make sure they don’t damage or even outright destroy the house she put so much effort into building and restoring. Halfway through that; however, things start to calm down as Lawrence and Javier are given reason to celebrate: Lawrence’s pregnancy and Javier overcoming his writer’s block. This cathartic relief, however, only serves as the calm before the storm that is the outright crazy third act which more than earns the film its hard R rating. The title Mother! infers images of a nurturing and life giving parental figure, and it vicariously speaks very directly to the film’s metaphors, which are open to debate. There are two theories to the film’s intentions as to what those metaphors actually are. The first is that the entire movie is an analogy about the inception and rise of Christianity; complete with an almost immediate rise to fame as the poet has created something, leading to complete chaos as the third act spirals deeper and deeper into brief images of war, executions, and even ritualistic sacrifices. The second is that the film is an artist verbalizing and then portraying the struggles of an artist trying to create something beautiful to a public that will never truly understand it, and to an agent who wants nothing more than to rip the heart out of everything the artist will create and share it to the ignorant and often blatantly intransigent public intentions and desires of said artist be damned. This film is quite graphic and harrowing at times, featuring images that are difficult to look at, but that is the intention of the director. Aronofsky is notorious for showing the ugly side of things that many of us would consider beautiful, and as such his metaphors become simultaneously poignant and widely distasteful. Those who can sift through the more horrific visuals, jarring pacing, and misleading subject matter might find a clever and dark, dare I say comedy, about creation and the public’s general inability to grasp what has been created and appreciate it for what it is. To call this movie outright bad would be overly insulting to the relatively clever and subversive movie that is a major departure from everything else that is being released recently. To call this movie outright good would be overly generous to a movie that really doesn’t provide anything palatable or even outright enjoyable for your average moviegoer. Truthfully, this movie doesn’t really have a lot to offer most people, but the ones who do find this style of film appealing will walk away happily, which is indicative of this director and the whole body of his up until and including this point. I would encourage you seeing the movie for yourself, but I would never tell anyone to go see this movie. One and a half stars out of four.